Most of the major ingredients that were part of the great 5th edition, are in the 6th edition as well, albeit with different proportions and ages (want to know the ages? contact Compass Box and they will tell you!) and there’s a subtle sherry cask influence that was not presents in 2015 edition but in the 2012 edition. 15,050 standard bottles and 800 large magnums were made, all bottled at 48.9% and as usual are non chill filtered and with natural color. So how this new 2018 recipe stands up to the 2015 edition? Nose: A no-miss Caol Ila and Clynelish notes, soft, clear and crisp peat, gentle smoke, sweet wax, a dash of lemon, pears, malt, minerals. After a few minutes, subtle waxy red fruit sweetness. Palate: Peat, lots of ashes, lemon, oak wood spice, pepper, minerals, salt, sweet honey and malt, dry and very smoky. Finish: Medium long length, spicy, sweet honey and maltiness, big peat spine, dry and waxy. Thoughts: Good one as it’s tasty with minerals and a heavy dose of peat smoke, but at the same time it’s a bit too ashy and drying. Comparing this new edition to the 5th edition, it’s clear that the nose in the 2015 release was far less ashy and was fruitier and waxy and the Palate was softer and richer and less drying. While it’s a good peated blended malt, I have to give the upper hand to the 5th edition as it came out more fruity and softer which equals to a better balance. 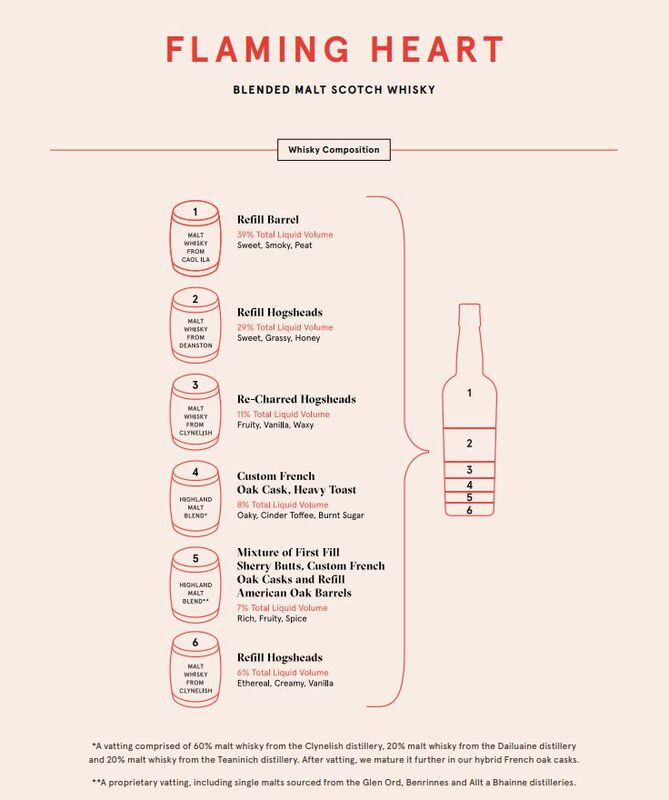 This entry was posted in Whisky Reviews and tagged Compass Box, Vatted Malt on November 12, 2018 by Yoav @ Whisky Gospel.